The KingKey (KK) 100 skyscraper is a result of an initiative to transform the Caiwuwei Village from a low-rise dull residential community to a thriving high-density urban place. Located on a 3.6 hectare site, it’s one among 6 other towers that complete the project by Joint Development Initiative. The villagers were made stakeholders for this project, and Farrells architectural firm sort to provide a design for a mixed-use skyscraper that would not only provide revenue for the community but also be a sign of new advancements in developing a high density urban zone. The KK 100 stands at a whopping 442 metres above the ground and at the time of completion was the tallest building in Shenzhen and one of 15 tallest buildings in the world. Its supremacy in Shenzhen will soon be thwarted by the Ping An International Finance Centre which will be 648 metres tall and set to be completed in 2016. However, the activity it brings to the development of this village won’t be undone anytime soon. The building has 100 stories comprising of over 210,000 square metres of accommodation. It houses a mall that is located on the first 4 floors, thereafter, floor 4 to 75 shelter Grade A office spaces. A six-star hotel knowns as St. Regis Hotel occupies 25 floors above that with a completely glazed sky-garden at the very top. The glazed curtain wall façade curves at the base to create an interesting canopy at the entrance to the offices. The shopping centre branches out from the other end. 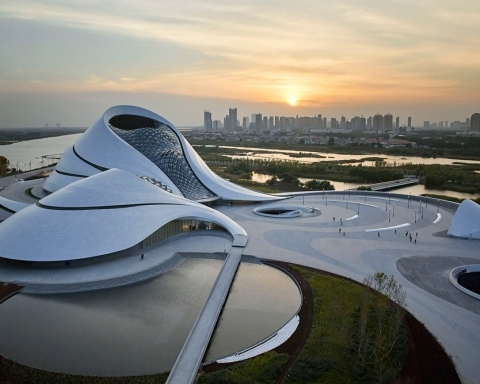 The architects designed this building’s curving profile to envision a spring or fountain intended to show the wealth and success of Shenzhen. The columns in the building have been strategically placed at the perimeters of various spaces to ensure an unobstructed working environment. The arrangement also allows the building’s users to experience amazing views all over Shenzhen and also towards the immediate Lizhi and Renmin Park. The roof features a curved smooth glazed curtain wall and steel structure instead of the traditional roofing methods. The whole project consists of five residential towers and two commercial buildings. Each villager was given a new home and another second property that would become an income generating asset. The skyscraper was integrated into the transport network of the metropolis. The masterplan of the site also features several levels of connectivity among the component buildings in order to provide easy circulation to the occupants.